Device drivers are without doubt some of the most important programs running on your PC. If any of them have bugs then this can lead to all kinds of problems: poor performance, unexpected crashes, spontaneous reboots, lengthy shutdowns, and a whole lot more. It pays to keep your drivers up-to-date, then, and Uniblue DriverScanner 2015 can help you do this quickly and with the minimum of fuss. To give your PC this valuable health check, just launch the program and click Start Scan. 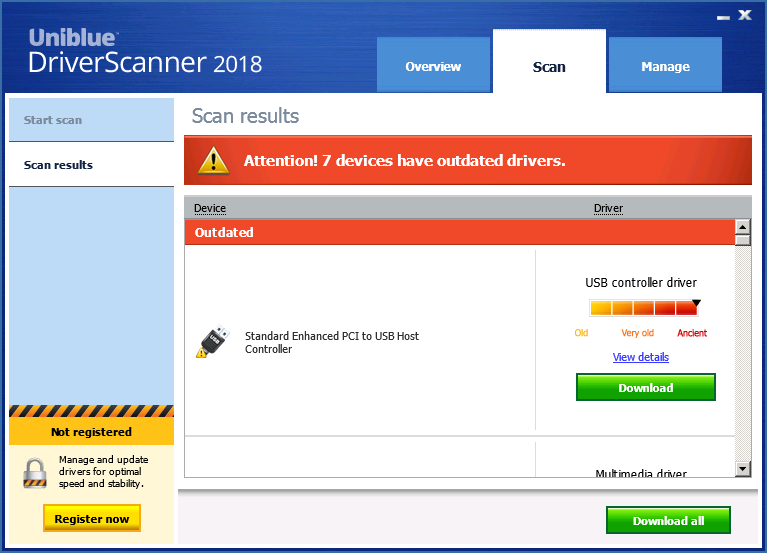 Uniblue DriverScanner 2015 will compile a list of your installed drivers and their version number, compare these with its own database of the latest versions, and let you know which drivers have updates available. That's just the start, though. If the program has found updates then it'll download them all at a click (and in parallel, for the best performance). You'll be warned about drivers that may be risky to install, perhaps causing system instability. But if everything looks good then you can install each update in turn with another click. Of course driver updates can sometimes cause problems, too - you might download a version that introduces a new bug, for instance. But Uniblue have thought of that, too. DriverScanner 2015 creates a restore point every time it installs a new driver, and so if you do experience any issues then they're easily fixed: just click the Manage tab, choose the appropriate Restore tab and your system will be returned to its previous state. Mark that driver as one to ignore and the program won't try to download it again, which means you'll be safe until a new, and hopefully fixed version appears.